I thought Mockingjay was the best in this series and I know very few people might share my point of view. - It's the most emotional part of the story. Katniss is not just a superhero but a simple teenager. The book has more depth. 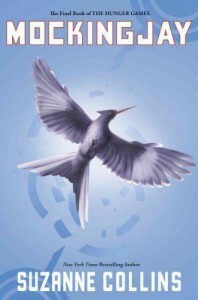 - After I read The Hunger Games I already realized Katniss was a selfish brat. Why was the story of Book One so extraordinary? Because of the suspense. Whould Katniss be able to survive and what would it cost her? The story was so cruel that it kept me (everyone?) very interested, interested like any viewer of the Capitol must have been. But the outline of the book I found very distracting. Okay, faked love. Wow. To survive, well ... okay. - Book Two was just: Oh, no, Susanne, you did it again. How cheap a trick. But it had the same effect. Suspense, to watch how people might survive. Or suffer. Or something like that. Because in the first two books everyone accepts the way it is. Okay, there must be the Hunger Games. It's just that. I could not believe Katniss would do it again. First she want's to leave her district and then she go's into another Hunger Games? And what about the districts with uprisings? How did the regime manage to gather the 'tributes' from these districts? Book Three now: as in Catching Fire implied Katniss is no super hero. She's just a teenager who had the courage to do things in the first Hunger Games that where not appreciated by the regime. But when she did that Katniss was detached from the regime (means: she did not have to fear a direct response like the regime killing her in the arena because the games had to go on). She was in a cruel arena, not more not less. In Mockingjay she faces all experiences she made. She's a wreck. She cries a lot and has a breakdown every 20 pages. I found that sort of thing much more believable as if there would have been a brat who's the uber hero now, a sociopath maybe. Now thinking about that love triangle Katniss-Gale-Peeta. In Mockingjay it is shown very precisely why there can't be a real bond between Katniss and Gale - because of the war. How their thoughts distinguish from one another. The last book is also an anti-war-book whereas the first two books are just 'spectator-books'. There is no black and white in this war. There's 'evil' also in the revolution (and Gale is a part of that). And Collins wants to point out the special power of the media in wartime. Who and what to show. The face of the revolution. To use that face. It's just for the show like in the Hunger Games. To influence and manipulate the spectators. In Mockingjay I liked Katniss more than before. Because she was human, she was facing cruelty, was fighting for herself and for others. There were more than one occasions to let Peeta go, but she always wanted to believe in him, wanted to save him. I thought she's not a selfish brat after all.